Melissa Foster discusses Megan's Way. Melissa Foster signs Megan's Way. Megan's Way is my debut novel. I am the Founder of The Women's Nest, a social and support network for women. My family and I reside in Maryland with our three dogs and two cats. We vacation in Cape Cod annually. My interests are anything outdoors, reading, writing, painting (I am a muralist), fishing, and running. I am happy to chat with book clubs, reader groups, or individual readers! Melissa Foster is a LibraryThing Author, an author who lists their personal library on LibraryThing. Melissa Foster's book Megan's Way was available from LibraryThing Member Giveaway. Melissa Foster chatted with LibraryThing members from Oct 1, 2009 to Oct 15, 2009. Read the chat. 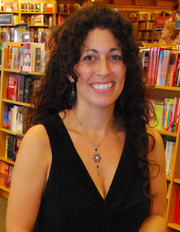 Melissa Foster is currently considered a "single author." If one or more works are by a distinct, homonymous authors, go ahead and split the author. Melissa Foster is composed of 3 names. You can examine and separate out names.